We don’t watch a ton of TV over here. In fact I do whatever I can to refrain from letting the kids watch TV. Don’t get me wrong, the TV gets turned on, I just loath to depend on the TV too much. I’m afraid it is a slippery slope and once I go there, there is no coming back. My personal fears aside, we discovered what I consider to be the greatest children’s show on the air to date. 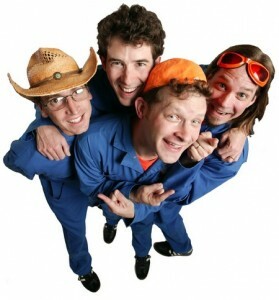 I’m talking about the Imagination Movers. Upon first glance, I swore those guys were just a failed garageband. However, after watching both of my kids dance and sing along with the catchy tunes I decided there was more than meets the eye. First, I love that there is a strong male presence in this show. It is endearing to me that a bunch of dads go out and jump around making goofs of themselves. Hailing from New Orleans, Imagination Mover’s music is actually good. As in good old fashioned rock ‘n’ roll. Their style is just like what I grew up with, influenced by bands like Devo and the Proclaimers. I am not at all ashamed to admit that some of their songs have come on my iPod while I was driving alone and I sang along and didn’t even notice that it was a children’s song. Their song topics range from not being afraid at night in your bed, to favorite snacks, to what you want to be when you grow up. If you enjoy a good dose of humor mixed with a touch of slapstick, a fair dose of morals, and teaching your kids how to be good problem solvers, this show is for you. It’s worth watching, so go open your Idea Box and solve some problems!